Recycled water is waste water that is treated, filtered and disinfected to Health Department Standards. Recycled water is used to irrigate large landscaped areas (parks, golf courses, and playgrounds) and crops. The use of recycled water reduces the water that is pumped from aquifers. In the Salinas Valley, where aquifers are over pumped, reduced pumping decreases the rate of sea water intrusion. Throughout California, recycled water is being used for irrigation to conserve our limited water supply. Appproximately 500,000 acre-feet of recycled water was used last year and it is predicited that 1,000,000 acre-feet will be used by the year 2015. Recycled water is not intended for drinking. All areas using this water must be clearly marked. A separate piping system utilizing purple pipe or purple markings is used to mark areas using recycled water. Monterey One Water (M1W) operates a large treatment plant located in the County Enviromental Park north of Marina off Del Monte Avenue. This plant will produce 19,500 acre-feet a year of recycled water for irrigation in the Castroville area to fight sea water intrusion. The farmers in this area will be able to reduce pumping from the aquifer and thereby fight sea water intrusion. This plant will provide recycled water for Marina. Presently in Marina, Gloria Jean Tate Park is piped for recycled water. The external landscape of the Sea Breeze development at Beach and Marina Drive, the new 7-11, and the Comfort Inn have also been piped for recycled water. Once connection to the M1W recycling facility is made, the District will be able to expand the recycled water distribution system. The environmental review process, which will enable connection to the M1W plant, has already begun. The golf courses at Pebble Beach have been using recycled water for several years. 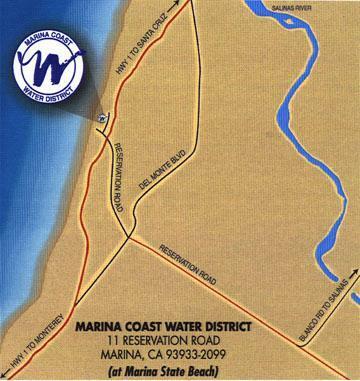 A study completed by the Monterey Regional Water Pollution Control Agency and participated in by Marina Coast Water District has identified uses of recycled water in the urban areas of Marina, Fort Ord, Seaside, Del Rey Oaks, and to Monterey. Recycled water will become an essential tool for conserving our water supply. The use of recycled water will grow as we become more adept at using this valuable source of water.